Series of events throughout the month of May to celebrate the Indianapolis 500. Details of the events and competitions, board of directors, volunteer and internship opportunities. Series of events surrounding the annual running of the Indianapolis 500. Details of events and competitions, board of directors, volunteer and internship opportunities. Provides league news, events, schedules and volunteer programs. A site for people interested in volunteer ski patrol. Also reference site for current volunteers. News, contacts, calendar, and proform. Offers short term volunteer opportunities in Honduras for youth coaches, coach trainers, referee trainers and interns. Additional opportunities to help develop the Soccer Mastery Training System. Membership details, clinics, league information, calendar of events, volunteer opportunities and related links. A volunteer staff supports area tournaments, events, and teams and features standings, pub listings, and news. Located in Baton Rouge with news, newsletter, upcoming events listing, picture gallery, related links and volunteer opportunities. Equestrian volunteer organization devoted to the preservation and maintenance of National Forest multiuse trails. Features events, membership details, photo album. Womens roller derby league. Description of the sport, season schedule, events calendar, team rosters, sponsorship opportunities, volunteer needs, and photographs. 15 Special Olympics Australia Official website. Official website. Includes program history, calendar of events, athlete profiles, sponsors, information about regional and local programs, volunteer opportunities, and other topics. Operated as a non-profit corporation chartered in the State of Tennessee. Information on club activities, shows and events, membership list, newsletter, and links. Hosts of the St. Louis Marathon and many other races. Site includes a calendar of events, race results, board members and contacts, membership information, places to run in the area, and how to volunteer. A volunteer mountain bike patrol at Minnewaska State Park and the Mohonk Preserve. Includes local information, membership form, events, and contacts. Annual event at Greystone Golf and Country Club in Birmingham, Alabama. Includes news, scores, events, tickets, photos, supported charities, volunteer information, and links of local interest. Located in Bulls Gap. This 4/10 mile, high banked, clay oval features Late Models, UMP Open Wheeled Modifieds, Super Stock, Mini Stock and Sportsman racing events. You can race your family sedan against the clock, participate in road and performance rallies, race purpose-built race cars at tracks like Buttonwillow Raceway Park or California Speedway, or be a volunteer worker at events like the Long Beach Grand Prix. A nonprofit, all volunteer horse riding organization made up of family, single and youth members to promote riding and equestrian activities. Our members come from a wide variety of horse interests including breeding, showing, dressage, endurance, pleasure, and simple recreation. Membership, calendar of events, officers, and contacts. Nonprofit all volunteer organization which seeks to preserve the ballpark. Announcements, organizing committee, and how to volunteer. If the business hours of Victoria Special Olympics in may vary on holidays like Valentine’s Day, Washington’s Birthday, St. Patrick’s Day, Easter, Easter eve and Mother’s day. We display standard opening hours and price ranges in our profile site. We recommend to check out victoriaspecialolympics.com for further information. 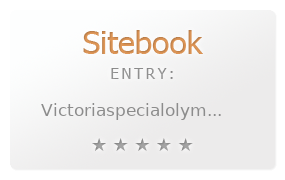 You can also search for Alternatives for victoriaspecialolympics.com on our Review Site Sitebook.org All trademarks are the property of their respective owners. If we should delete this entry, please send us a short E-Mail.